We have revamped our Terms of Service, Privacy Statement and Data Processing Agreements with particular emphasis on making them easier to understand and as transparent as possible. In summary, Pubble stores all personal data in the EU. Any personal data collected adheres to the "Privacy by default" guidelines as stated in the EU General Data Protection Regulation (GDPR). This means that the strictest privacy settings are applied to your personal data by default. The data collected is used solely for the purposes of providing a service to our customers and is not used for marketing purposes or sold to any third party under any circumstances. What changes have we made to the Pubble app from a technical point of view in order to comply with GDPR regulations? We have made significant changes to Pubble in order to comply with the GDPR. The Admin Panel contains a new section allow our customers to set their privacy requirements in order to comply with the GDPR. We call this the "Privacy Panel". This section allows you to set your data requirements as well as being able to approve the sub-processors that Pubble uses. 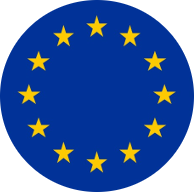 Under the GDPR data subjects have the right to access the personal data stored on their behalf. In addition, they have the Right to be Forgotten, the Right to Portability and the Right to Rectification of their data. Should a user enforce their rights, Pubble gives you (the Controller) complete control to ensure that you can accommodate your customers' requests in relation to their data. Data subjects can request and access any data that a data controller is holding on them and to find out if that data is being processed or not, where it's being held, and, for what purpose. From the visitor record, the data controller has access to and can manage all of the personal data that Pubble holds. On request, customers now have the option to delete their community on Pubble and/or member accounts. Note: Customers always had the ability to add/remove team members as necessary and this has not changed. Organisations need to be able to capture security events in the form of audit logs to be able to confirm if a breach has taken place, and if so, how to measure the impact of that breach and determine what needs to be reported to the DPA (if necessary) and, ultimately, the affected data subjects. The Pubble audit log tracks anything on the Pubble app that can be added, updated and deleted. This is an extensive list that includes things such as community, account, team members, visitor posts etc. The audit log records who made the change with an associated time stamp. This gives a community administrator a log to refer to in case of any security breach or an audit. The Privacy Panel now has a section where our customers can reference their Privacy Statement. If the option is chosen to request consent from the data subject before submitting personal data to Pubble, the Privacy statement will be linked in the consent statement. 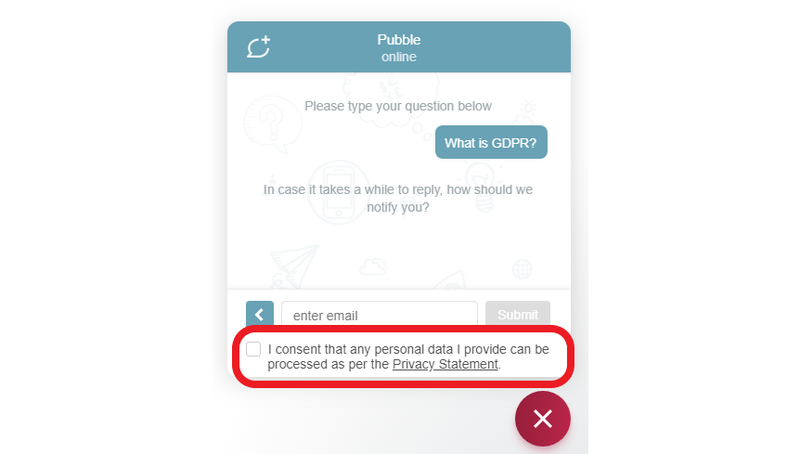 Pubble has added an option to add a check box to each of the Pubble apps before a request to obtain personal data (See Image 1). This allows the data controller to explicitly request consent from the data subject to collect personal data from them. What changes have we made to the Pubble website from a technical point of view in order to comply with GDPR regulations? On creating an account, Pubble needs certain personal data in order to allocate the account correctly. The information we collect is name and email address. 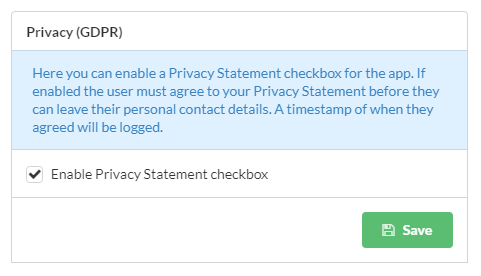 We have added a checkbox for users to agree to the Pubble Terms of Service and Privacy Statement at this stage. 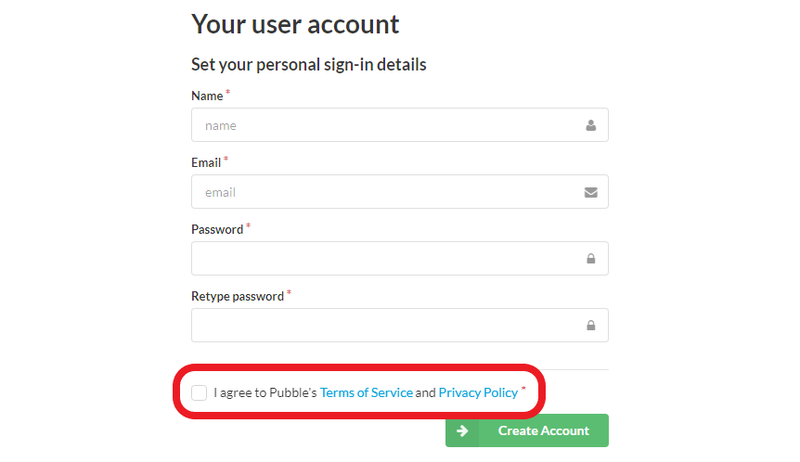 Users have to agree to the terms wherever a Pubble account is created e.g.  if a new user is invited to an existing community or if the community offers self-registration. Who should I contact if I have a question about Pubbe & GDPR?